Chris Rabb isn’t just running for State House in Pennsylvania. He’s singlehandedly bringing jobs to Philadelphia — and specifically hiring young people. See, Chris is running to represent northwest Philadelphia. A part of the city that has few resources for young people, especially those from low-income backgrounds. It’s a big reason why Chris Rabb is running for State House, and he’s not waiting for election day to make changes. His campaign is hiring and training young people in northwest Philly to help mobilize voters to get to the polls on Tuesday. It’s a temporary job, but it offers $15 an hour and gives these youth in his district a job to add to their resumes. By hiring young people in his district, Chris Rabb is using his campaign to highlight unemployment — and youth unemployment specifically — in Philadelphia. It’s a novel idea, which is par for the course for Chris Rabb. His book Invisible Capital gained wide recognition for showcasing alternative models for community development that keep revenue in local communities and out of the pocket of corporate real estate developers. And he didn’t stop there. While teaching at Temple University, Chris Rabb led the charge to unionize adjunct professors — who often work for low pay, no benefits and no job security from semester-to-semester. 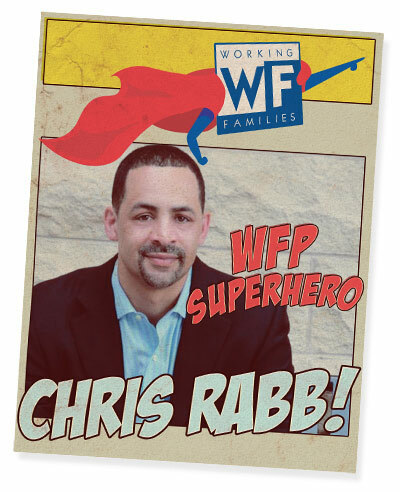 Now he’s a WFP Superhero running for State House in Pennsylvania, where he can put his innovative ideas into action.